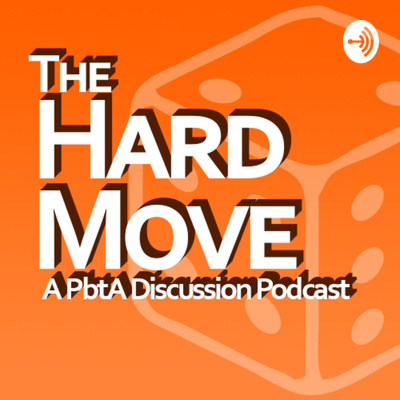 The Hard Move is a Powered by the Apocalypse (PbtA) RPG discussion podcast. Each episode a guest and I focus on a single move, diving into how the move works mechanically, how players can use it narratively to drive the fiction, and how GMs can react to the move. Join me every Wednesday as I welcome a new guest to name their move and play to find out what happens. Please subscribe on Anchor, iTunes, Google Play, or wherever you find podcasts. Also consider supporting the show on Patreon. Becky Annison and I dive into her upcoming game Bite Me! and explore the complicated dynamics of werewolf pack authority. The move Make A Challenge is used as a mechanical device whenever someone willingly, unwillingly, or even unknowingly challenges the leadership of the alpha. This move has some wild effects ranging from swapping playbooks to permanent stat modifiers. Narratively this move can shape the entire course of the game, moving power around and breaking social norms. For the GM, there’s a lot to manage but Becky comes through with some tips for GMs to get your through it. You can follow Becky on Twitter at twitter.com/BeckyAnnison and check out her work at blackarmada.com Content featured in this episode is from Bite Me! by Becky Annison. For more information, visit bit.ly/BiteMeKS Music is by Nick Gravelyn. You can find more of his work at nickgravelyn.com You can follow the show on Twitter at twitter.com/thehardmove Support the show at patreon.com/thehardmove and subscribe to The Hard Move on iTunes, Google Podcasts, or your podcast platform of choice. Rev Deschain and I check out the move Act Under Pressure from Monster of the Week. This seemingly generic move is used whenever there is risk or doubt about the success of an action and offers a wide assortment of both mechanical and narrative outcomes. We talk about how Rev uses this move to cover the success and failure of multiple moves into one roll and how he provides several narrative options for his players to choose from. As the GM, Rev thinks the more options the better, and puts the power back in the players’ hands. You can follow Rev on Twitter at twitter.com/RevDeschain and check out The Crit Show at twitter.com/thecritshow Content featured in this episode is from Monster of the Week by Michael Sands. For more information, visit evilhat.com Music is by Nick Gravelyn. You can find more of his work at nickgravelyn.com You can follow the show on Twitter at twitter.com/thehardmove Support the show at patreon.com/thehardmove and subscribe to The Hard Move on iTunes, Google Podcasts, or your podcast platform of choice. Lloyd Gyan and I expand on a Twitter conversation by discussing Take A Powerful Blow from Masks. In a game where super humans battle it out with fists and wits, the concept of harm is replaced with systems of conditions and narrative outcome. This move mechanically encapsulates what it’s like for a super teen to take a hit, physically or emotionally, and what happens after. Narratively this move has a lot of options for players to choose their own adventure, and the GM also weighs in heavily if the enemy gets an advantage as a result. You can follow Lloyd on Twitter at twitter.com/druggeddwarf and check out the One Shot Club at discordapp.com/invite/Y4DRYdA Content featured in this episode is from Masks by Brendan Conway. For more information, visit magpiegames.com Music is by Nick Gravelyn. You can find more of his work at nickgravelyn.com You can follow the show on Twitter at twitter.com/thehardmove Support the show and subscribe to The Hard Move on iTunes, Google Podcasts, or your podcast platform of choice. Jonah M. Jackson and I launch into Uncharted Worlds to discuss Transform, a move from the Shaper playbook found in the Far Beyond Humanity expansion. This move is mechanically light, relying on another basic move for its trigger, but offers amazing flexibility in play. As you might expect when morphing into wild, alien beasts, the narrative impact of this move can be widely varied depending on the situation. The GM doesn’t play a major role in the actual move, but it’s incredibly important for you to discuss how you plan to use this move prior to the game. You can follow Jonah on Twitter at twitter.com/jonahmjackson and check out The Quest Company at questcompanypodcast.com Content featured in this episode is from Uncharted Worlds by Sean Gomes. For more information, visit uncharted-worlds.com Music is by Nick Gravelyn. You can find more of his work at nickgravelyn.com You can follow the show on Twitter at twitter.com/thehardmove Support the show at patreon.com/thehardmove and subscribe to The Hard Move on iTunes, Google Podcasts, or your podcast platform of choice. Marsie Vellan and I head back into Monsterhearts 2 to check out another pivotal move for any teen monster, Keep Your Cool. Mechanically it’s simple: you try to keep your wits about you in a tense situation and, if you’re cool enough, you could come out the other side with valuable insight about the situation. Narratively this move can drive virtually any scenario, from facing down the school bully to professing your love to someone. The GM gets to weigh in by answer questions, discussing character vulnerability, and issuing hard moves if things go south. You can follow Marsie on Twitter at twitter.com/MarsieVellan and check out the Phantom Rollbooth Patreon at patreon.com/phantomrollbooth Content featured in this episode is from Monsterhearts 2 by Avery Alder. For more information, visit buriedwithoutceremony.com Music is by Nick Gravelyn. You can find more of his work at nickgravelyn.com You can follow the show on Twitter at twitter.com/thehardmove Support the show at patreon.com/thehardmove and subscribe to The Hard Move on iTunes, Google Podcasts, or your podcast platform of choice. Lauren McManamon and I talk about her game Girl Underground as we discuss the move Stand Strong in Your Convictions. At the heart of this game is a sense of empowerment and discovery by The Girl who is striving to turn imposed manners into personal beliefs. Mechanically this move calls on those beliefs to help The Girl overcome challenges she may face and narratively color the action around how the challenge is dealt with. The GM is pretty hands-off with this move, only stepping in to mix things up on a miss. You can follow Lauren on Twitter at twitter.comthestraykiwi Content featured in this episode is from Girl Underground by Lauren McManamon and Jesse Ross. For more information, visit girlunderground.org Music is by Nick Gravelyn. You can find more of his work at nickgravelyn.com You can follow the show on Twitter at twitter.com/thehardmove Support the show at patreon.com/thehardmove and subscribe to The Hard Move on iTunes, Google Podcasts, or your podcast platform of choice. Kyle Gould and I look into his first PbtA game, Blades in the Dark, and explore the move Mesmerism from the Slide playbook. Mechanically this move augments the Sway action, allowing the Slide to trick their victims into not remembering the experience. Narratively it sets up easy outs, but can also come back to haunt you if your victim catches up with you. For the GMs, there is more opportunity than risk here as you have numerous ways to turn this back on the Slide. You can follow Kyle on Twitter at twitter.com/taverntalesdm and check out Tavern Tales at taverntales.ca Content featured in this episode is from Blades in the Dark by John Harper. For more information, visit evilhat.com Music is by Nick Gravelyn. You can find more of his work at nickgravelyn.com You can follow the show on Twitter at twitter.com/thehardmove Support the show at patreon.com/thehardmove and subscribe to The Hard Move on iTunes, Google Podcasts, or your podcast platform of choice. Brandon Leon-Gambetta and I get steamy and talk about Express Your Love Passionately from his forthcoming game Pasión de las Pasiones. Mechanically we talk about modifying rolls by answering move and playbook questions as well as the outcome of such emotional expression. Narratively this move is chalk full of opportunities to fall in love, make an enemy, or anything in between. Finally, we discuss how the GM acts as a cheerleader and enabler more than an arbiter or decision maker. You can follow Brandon on Twitter at twitter.com/drcaptainkobold and check out Stop, Hack, and Roll at stophackandroll.com Content featured in this episode is from Pasión de las Pasiones by Brandon Leon-Gambetta. For more information, visit magpiegames.com Music is by Nick Gravelyn. You can find more of his work at nickgravelyn.com You can follow the show on Twitter at twitter.com/thehardmove Support the show at patreon.com/thehardmove and subscribe to The Hard Move on iTunes, Google Podcasts, or your podcast platform of choice. Renee Rhodes and I stumble into the move Oops! from Monster of the Week. This move comes from the Mundane playbook and offers the player a mechanical way to luck into finding some crucial information for them to share with the other Hunters. Narratively, this gives the Mundane player a lot of control over the story and allows them to still influence the world even if they don’t have paranormal gifts. We also discuss how the GM can help make this move fun and powerful without taking away from the rest of the players’ experience. You can follow Renee on Twitter at twitter.com/RaeDeAnneR and check out Fate and the Fablemaidens at fatefmcast.com Content featured in this episode is from Monster of the Week by Michael Sands. For more information, visit evilhat.com Music is by Nick Gravelyn. You can find more of his work at nickgravelyn.com You can follow the show on Twitter at twitter.com/thehardmove Support the show at patreon.com/thehardmove and subscribe to The Hard Move on iTunes, Google Podcasts, or your podcast platform of choice. Ryan Boelter and I explore the genre-bending world of Chimera by looking at the basic move Embrace Your Chimera and the genre move The Power of Friendship. After an overview of the system, we talk about how the genre move gives more mechanical and narrative depth to the basic move, and how the basic move functions in the rules-light system. We also talk about what it looks like for a group to team up to take on the Big Bad and how the GM can work with the players to encourage amazing scenes. You can follow Ryan on Twitter at twitter.com/lordneptune and check out the Character Creation Cast at twitter.com/CreationCast Content featured in this episode is from Chimera by Ryan Boelter. For more information, visit patreon.com/ryanboelter Music is by Nick Gravelyn. You can find more of his work at nickgravelyn.com You can follow the show on Twitter at twitter.com/thehardmove Support the show at patreon.com/thehardmove and subscribe to The Hard Move on iTunes, Google Podcasts, or your podcast platform of choice. Murphy and I gear up for another visit to Monster of the Week by analyzing the Expert Playbook move Preparedness. This move represents the Expert’s vast knowledge and stockpile of gear, trinkets, and artifacts and mechanically lets the player access them when it’s needed most. This move also can completely reroute the narrative if the one item the party desperately needs is in a complicated location, requiring a diversion of their attention. We also talk about how the GM and player can work together to make sure this move is used in the proper spirit of the game. You can follow Jesse on Twitter at twitter.com/Jesus_H_Pharaoh and check out Table Tales at twitter.com/OurTableTales Content featured in this episode is from Monster of the Week by Michael Sands. For more information, visit evilhat.com Music is by Nick Gravelyn. You can find more of his work at nickgravelyn.com You can follow the show on Twitter at twitter.com/thehardmove Support the show at patreon.com/thehardmove and subscribe to The Hard Move on iTunes, Google Podcasts, or your podcast platform of choice. Jesse Ross and I delve into the mysterious and dangerous forest of Trophy to discuss the Risk Roll, one of only three in the game. It mechanically encapsulates navigating tricky situations and the risk involved, both physical and mental. This move drives the bulk of the story forward and offers players nearly complete narrative control. The GM can also entice the players to push their luck to achieve their goals at the risk of falling prey to the ominous forest. You can follow Jesse on Twitter at twitter.com/jesseross and check out his website at jesseross.com Content featured in this episode is from Trophy by Jesse Ross. For more information, visit trophyrpg.com Trophy is available in the December 2018 issue of The Gauntlet’s Codex. To subscribe, visit patreon.com/gauntlet Music is by Nick Gravelyn. You can find more of his work at nickgravelyn.com You can follow the show on Twitter at twitter.com/thehardmove Support the show at patreon.com/thehardmove and subscribe to The Hard Move on iTunes, Google Podcasts, or your podcast platform of choice. Ross Payton and I focus our minds on Scum and Villainy as we dive into the move Attune. From telekinetic powers to psychic visions to handling dangerous artifacts, this move offers a mechanical basis for a vast array of mental powers as well as narrative reward and consequence for opening your mind to the Way. We also discuss questions the GM can ask to help keep things flowing given the breadth of possibilities. You can follow Ross on Twitter at twitter.com/rosspayton and check out Role Playing Public Radio at patreon.com/rppr Content featured in this episode is from Scum and Villainy by Stras Acimovic and John LeBoeuf-Little. For more information, visit evilhat.com Music is by Nick Gravelyn. You can find more of his work at nickgravelyn.com You can follow the show on Twitter at twitter.com/thehardmove Support the show at patreon.com/thehardmove and subscribe to The Hard Move on iTunes or your podcast platform of choice. Meghan Dornbrock and I explore the shadow-filled world of The Watch and look at how the move Blow Off Steam gives deep meaning to downtime. This move mechanically helps you reduce Weary and gain Camaraderie, two tracks that determine how strung out or connected your character is. Narratively this move helps give guidance and importance to downtime activities that might otherwise go overlooked. For the GM, we talk about how giving control of the story to the players in these moments can pay off big. You can follow Meghan on Twitter at twitter.com/meglish and visit her website at meglish.com Content featured in this episode is from The Watch by Anna Kreider and Andrew Medeiros. For more information, visit peachpantspress.com Music is by Nick Gravelyn. You can find more of his work at nickgravelyn.com You can follow the show on Twitter at twitter.com/thehardmove Please consider subscribing to The Hard Move on iTunes or your podcast platform of choice. Brie Sheldon and I struggle with our inner beasts as we take a look at both Mind Your Manners and Be Understood from their game Turn. These moves represent how characters handle the instincts of their beast and human selves as they attempt to navigate their everyday lives. Mechanically these moves can contribute to Exposure, leading characters closer to being revealed as shapeshifters and provide a springboard for endless narrative opportunities. We also talk about the GM principles in Turn and how they contribute to addressing character struggles. You can follow Brie on Twitter at twitter.com/thoughtygames and visit their website at briecs.com Content featured in this episode is from the game Turn by Brie Sheldon. You can learn more and back Turn on Kickstarter at tinyurl.com/TurnKS Music is by Nick Gravelyn. You can find more of his work at nickgravelyn.com You can follow the show on Twitter at twitter.com/thehardmove Please consider subscribing to The Hard Move on iTunes or your podcast platform of choice. 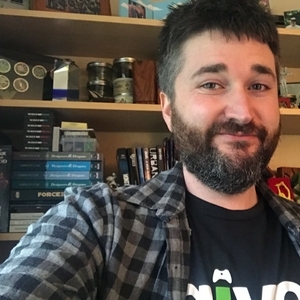 Hello, I'm Matthew Gravelyn and I love Powered by the Apocalypse games! Join me every week as I welcome a new guest on to name their move and we’ll play to find out what happens. This is The Hard Move. Subscribe on anchor.fm/TheHardMove or wherever you find podcasts.